Film Date: NOV 27 - 29? - One of the twins gets hurt doing the dervish challenge and also on the floor during another challenge wearing black singlet? Interesting promo for this one. It looked like one of the cheerleaders might have hurt themselves. I haven't had the opportunity to see the episode 5 yet, but if there is a penalty involved (note - there was), the team that incurred it would be starting far later than other teams. If leg 6 is linear, then there could be little chance for them to catch up. Prediction: Gallipoli. Didn't we have a bus spoiler in Turkey? You've already asked this question before. I already have given you the answer. NO, we do not have a bus spoiler in Turkey. But even if we did have a spoiler and you weren't sure, it probably wouldn't hurt to check the timeline thread, yeah? 1. No matter what else, James and Sarah will start at least 4 hours behind Shane and Andrew, who are behind 4 other teams. 2. Ross/Tarryn start at least 4 hours behind Shane and Andrew and also have a Marked for Elimination penalty of 30 minutes if they fail to place first in leg 6, which would be virtually impossible unless there is a major bunching point, unlikely since they are not traveling elsewhere except maybe on buses to Gallipoli. I predict that Ross & Tarryn will finish the leg before James & Sarah, but not by more than half an hour. 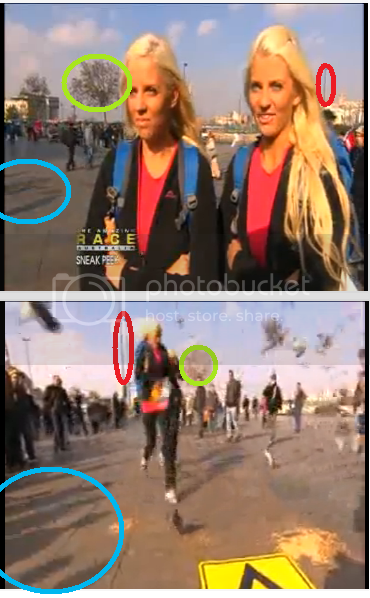 I saw it and Michelle and Jo were running towards it? When Michelle & Jo say "Game on" they are just standing around what looks like to be where the yield is. You don't see it in the shot, but the background looks to be the same in comparison of when they were running up to the yield at :03. 100% sure Michelle & Jo were Yielded. Same trees, light posts, and floor. The shadows are in the same direction. Plus, when they are standing there, their arms are crossed. Typically when you approach and U-Turn/Yield board, you aren't as "relaxed." Here's the screenshot. As much as I dislike Paul & Steve, it would be a smart move Yielding the twins, as they are definitely the dark horses of the race I love them! In last week's episode of The Amazing Race Australia, teams turned on each other while travelling through Dubai. This week the remaining 8 teams race through beautiful Istanbul, where a Turkish bath challenge has contestants in a lather. And what will happen when racers are faced with a burly pack of Turkish oil wrestlers? Workmates Paul and Steve start to wreak revenge. And could a nasty accident mean the end of the race for one team? The Amazing Race Australia screens Mondays at 7.30pm on Seven. My thought: Why would Paul & Steve Yield Michelle and Jo instead of Joseph and Grace after the conflicts of last episode? Because they're playing with their heads instead of their hearts. About time we saw a team use their power strategically instead of socially. Promo reloaded! Will do the caps later today. Is that PAUL who gives Michelle a chop to the neck? I think Paul was further away, the last person to be seen in the foreground on the right, just before the camera angle changes. When we see the group from the other angle a few seconds later, look at the length of Paul's pants. His are just above the knee, while the other guys have pants just below the knee. at least, the twins screentime is getting more interesting. the last 5 legs, they did not shine that much from being always in the front of the pack. CAPS! Sorry the quality is not better. DO we have all these locations ID'd? Dervishes, Detour Clue, wrestling. Pitstop? anyone know which part is the yield going to appear? Will it be before roadblock? how would it make any sense to yield a team that isn't one of the two teams that are 4 hours behind? is a first place prize that much more important than having a say in who gets eliminated? Not just the prize, being first to depart on the next leg is a big thing. they can get a on an earlier flight alone and make a bigger lead. 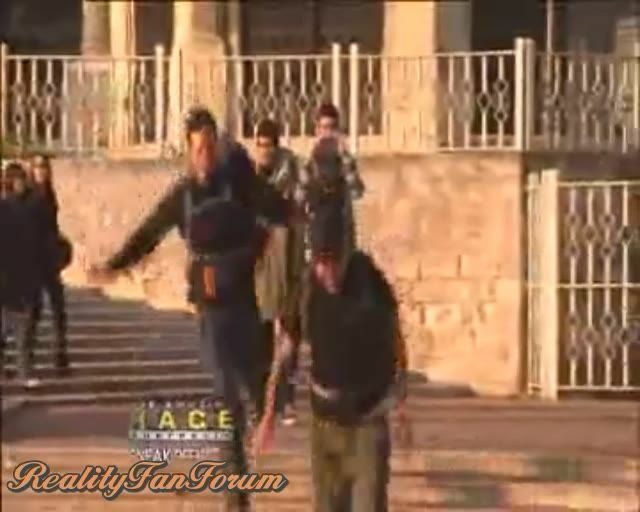 If the steps Paul & Steve and Lucia & Emilia are seen running down are the pitstop, then it's at Istanbul University. Nice one Howie!! Okay...one location down! We can't be sure that is the Pitstop though, but for sure a location. And these caps have been all spliced out of order...But for sure caps 14, 19, 20, and 21 all take place after the Michelle injury because Jo is carrying both packs...so possibly that is on the way to the Pitstop? I was just looking at Topkapi Palace to see if there was a match for that long low bldg,lol. Problem is, we aren't sure of the order of tasks. And not ure I see Lucy and Emilia? Remember too that teams may not KNOW that the teams are 4 hours behind...in which case they would pick a team that they are 100% sure is behind them. Go look here!! 3D panoramia! STEPS! I still think its more important to yield someone with the aim of eliminating them so that you don't have to race against them in the future. eg. if rob & amber yielded uchenna & joyce instead of ron & kelly, they might've won the race. DEFINITION of awkward? A challenge in an actual Turkish bath where the couples have to wash each other vigorously enough to reveal a clue hidden in a bar of soap. Remember there are brother-and-sister and father-and-daughter combos left. Cougar Sarah pulls some soapy stunt trimmed out of this timeslot. What's with hard-to-like Paul, who bragged about his impressive IQ, using the phrase "more easier"?